GAP8 is a System-on-a-Chip that enables massive deployment of low-cost intelligent devices that capture, analyse, classify and act on fusion of rich data sources such as images, sounds or vibrations. GAP8 integrates everything necessary to acquire from sensor, pre-process, analyse and act on rich data sources integrated into a single device. This allows GAP8 to have an energy efficiency that is compatible with operation for years on batteries and a system cost that enables massive deployment of embedded, intelligent devices. GAP8 is based on many years of research into ultra-low-power parallel processors carried out in the Parallel Ultra Low Power (PULP) project by ETH Zurich and the University of Bologna. This heritage results in an extremely rich, integrated architecture in an IoT Application Processor that delivers low power operation in real customer use cases. What technology is behind GAP8? GAPUINO is an Arduino Uno form factor board (master) that includes a GAP8 and all the peripheral interfaces necessary to prototype GAP8 applications, compatible with most Arduino shields.It leads out all necessary I/Os and includes a USB to serial and JTAG bridge that allows you to program the on board flash and debug your GAP8 applications. Whether you are a company developing algorithms for image, sound or vibration analysis, a company developing sensors that need to process rich information or a programmer that wants to learn more about extremely efficient edge computing using an advanced, low-power compute cluster GAPUINO and the GAP8 HDK and SDK is designed for you. What can you do with GAPUINO and the GAP8 SDK? The GAPUINO sensor board adds a range of ancillary sensors to GAPUINO. 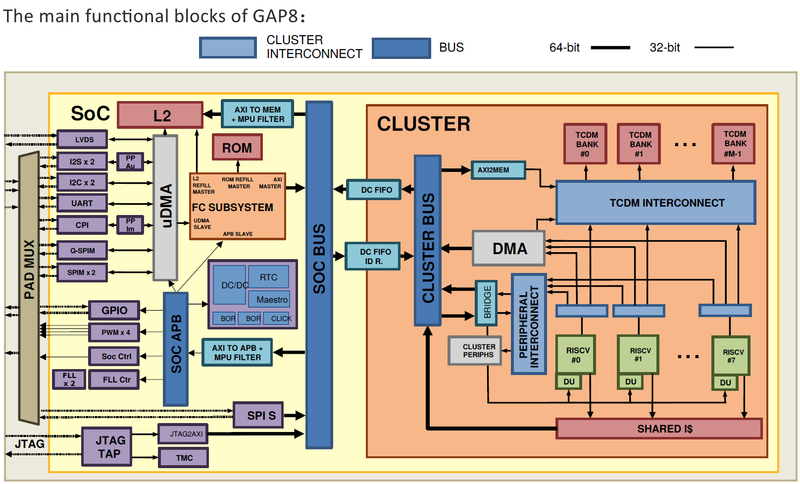 GAP8’s extended instruction set and hierarchical, highly integrated architecture allow it to deliver power and cost efficiency in wide range of AI and signal processing tasks used in processing rich data. Processing and interpreting rich data such as images, sounds or vibrations on an edge device eliminates the need to transport large quantities of data to the cloud making sensors compatible with low power wide area networks (LPWANs). GAP8 can deliver more power efficiency over a wider range of compute tasks than any other ultra-low power processor available today. This allows device manufacturers to integrate artificial intelligence and advanced classification into autonomous wireless edge devices in many different application areas. -What problems can GAP8 solve? Computer Vision: GAP8 runs complex computer vision algorithms such Convolutional Neural Networks (CNNs) for Object Detection and Recognition and Counting. For example, it can classify a QVGA image every three minutes for 10 years on a small 3.6 Ah battery. Audio Signal Processing: GAP8 can allows a complete audio processing stack to be implemented using a single processor: microphone-array beam forming, noise reduction, echo cancellation and keyword or sentence recognition. Machine Health Monitoring: Predictive maintenance needs multi-sensor analysis: vibration, lubrication, electric motor monitoring, infrared tomography, and alignment & balancing. GAP8, with its autonomous sensor data fusion embedded capabilities, can reduce sensor deployment and operational costs by uploading the right maintenance information at the right time for years on a battery.